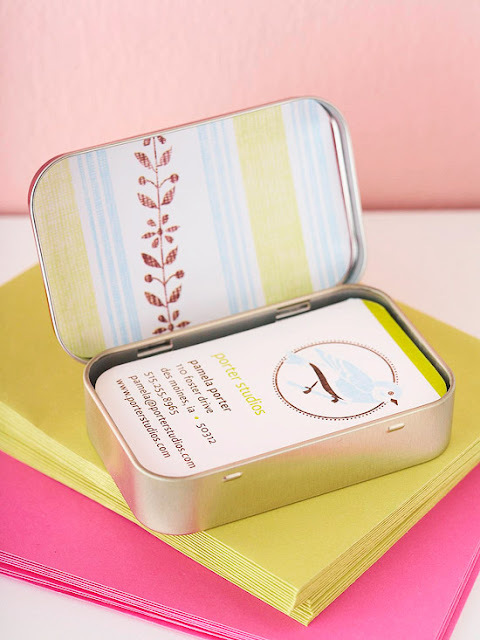 Ran across this idea on Pinterest earlier today: decorate a used mint tin (like an Altoids box) with pretty paper to create a unique business card holder. This would also work brilliantly with a vintage photo or two as decoration, instead of (or in addition to) scrapbook paper. DIY business card holder, via BHG.com. Cute. I find these little tins handy for small knitting needs, like rings, darning needles, etc. Great idea! Do you decorate them? Somehow I have an image in my head of using felt, perhaps layered with cute cut-outs, to decorate tins used for knitting or sewing storage. Or, alternately, finding vintage images of the thing being stored (e.g., an old magazine ad for needles) and using that to decorate the tin.